2 hours later and it was time to join Simon and 4 additional members at La Gare in Regnéville..
We started our afternoon in clear and sunny weather standing on the seafront behind La Gare overlooking the harbour and sand bar. 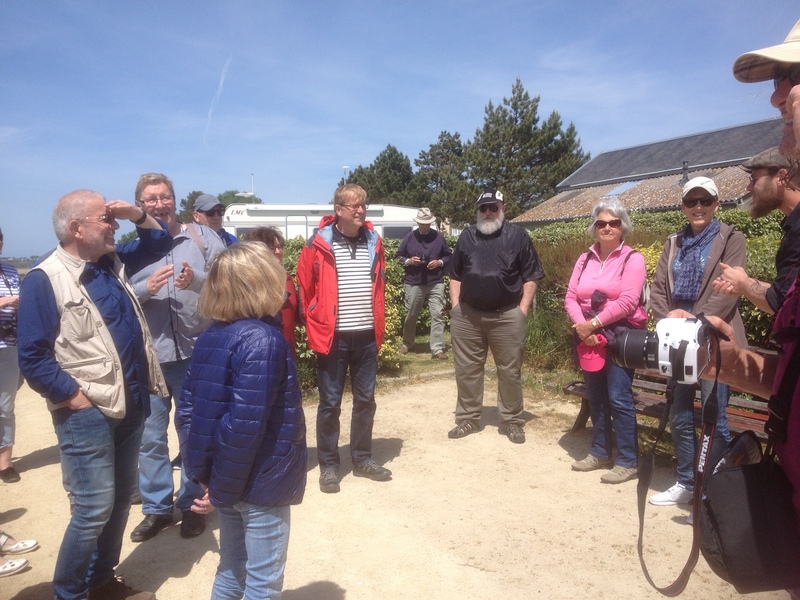 We listened as Simon’s knowledge and enthusiasm brought Regnéville’s history to life while he outlined the origin and development of the town. 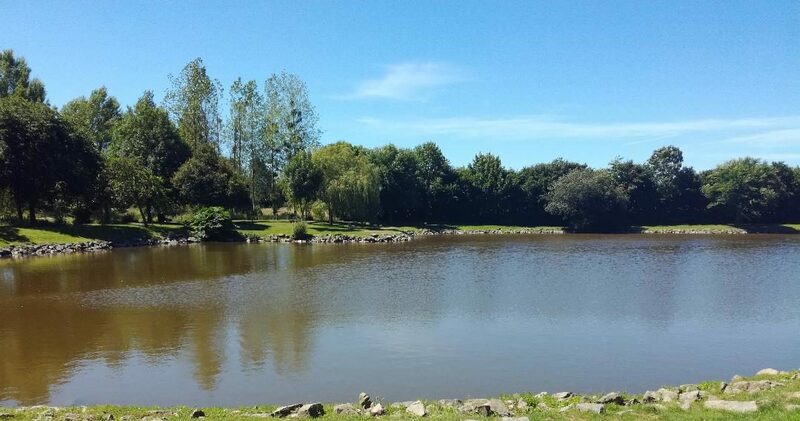 Regnéville began with the arrival of Vikings in the 9th century. The Sienne estuary provided a safe harbour and, in time, these Vikings encroached into the hinterland of Regnéville. Eventually the French King conceded that they could “retain” this acquired territory on condition that they accepted the King as their sovereign and defended the harbour and surrounding area from any future Viking raids. The Vikings have a reputation as raiders but they were also traders. Following the initial Viking trading, over time through the markets at Agon and Montmartin the economic importance of the area grew to a point where the King had to act to protect his interests. The castle was built at the start of the 13th century to defend against attack from the sea and to safeguard the local markets and up river towns. The castle would not only be living quarters for the King’s bailiff and garrison but would enable the State to control and administer the area and collect all due taxes. The port of Regnéville, along with many others throughout Normandy, become part of the French cod fishing industry that developed off the Newfoundland coast in the 16th century, this fleet providing a significant part of overall French fishery production. The exportation of lime manufactured in kilns adjacent to the castle generated an increase in port traffic in the 1850’s but this proved short lived. castle and the keep which had been rebuilt as a tower by the English during the Hundred Years War. We wondered how the precarious top storey overhang of the keep did not crash down on the sheep grazing directly below. 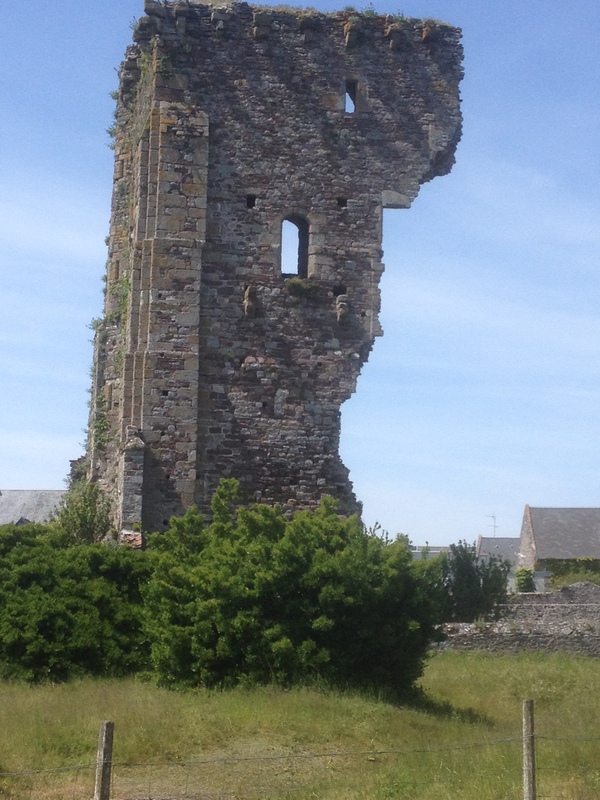 The English Bailiff of Cotentin set up residence at Regnéville from 1435 until 1448 but once the Hundred Years War ended the castle lost its military importance. Eventually the tower was packed with gunpowder and blown up by the French King in 1637, however 2 of its 4 sides remain, exposing to view the 10 feet thick outer walls, spiral staircase and floor construction. for reasons open to speculation, was never built to full height and remains truncated. The very low entrance door took us into the nave where we could see a number of alterations to the structure together with the more recent restoration of the timber barrel vault ceiling. In 1900, the very last year of the 19th century, the chancel was refurbished with new brightly stained glass windows, each one inscribed on the bottom panel with the date andname of the donor. Leaving the church grounds, we turned into a narrow lane taking us through the old village of Regnéville with its compact houses snuggling together. Some of these have been altered or extended employing contemporary designs and modern materials which blend in surprisingly well with the original building style. We saw a horizontal rebate cut in a stone arch gateway that allowed protruding cartwheel axles to pass into the village and nearby a blocked in doorway possibly associated with tax collection. Our tour complete and back outside La Gare, it was time to thank Simon and make our way home.